Note: This was published in an incomplete form, that will stop happening now. Sorry about that. I have a few left over beers from the 10 years I was brewing but not maintaining this meager blog space. When I come across these old beer, or decide to check on them, I’ll throw up a post about that beer. Basically transcribe the small amount of notes I have on the brew. At the very minimum, it will give me a chance to review the beer. I don’t do very many stouts, and in the past even fewer. My beer tastes tend toward the lighter side of things. This is probably evident to anyone that even passively reads this blog as I post almost entirely saison recipes. I do make stouts though, currently there is a Russian Imperial Stout in a bourbon barrel (more on that later) and I make an annual coffee oatmeal sweet stout for my wife. For this version of the beer I allowed some Brett c to get into the primary fermentation, but at a really low rate. Just to see what hints of Brett I could get and if it would complement the flavors. In general, I am not a fan of dark Brett beers. I don’t think the roast plays well with a lot of funk. But since this stout isn’t very roasty, I figured what the hell. Beer was mashed with a pH stabilizer in 4 gallons of water at 154 F. Sparge was done with about 5 gallons of water at 165 F.
Wort was brought to a boil quickly and held there for 70 minutes, nothing much to report. Wort was chilled with an immersion chiller for 45 minutes, no clarifiers added to the boil. Beer was fermented first with WLP004, Irish ale yeast. Fermentation took off quickly and allowed to “complete” to 1.010 where a bottle of the Brettanomyces ale was added to the fermenter. It sat for about a month before bottling. Beer was not carbonated very aggressive at the time of bottling as the FG had not apparently dropped. I was afraid that the Brett would drop the gravity more so I only added one volume of CO2 to the bottles for priming. 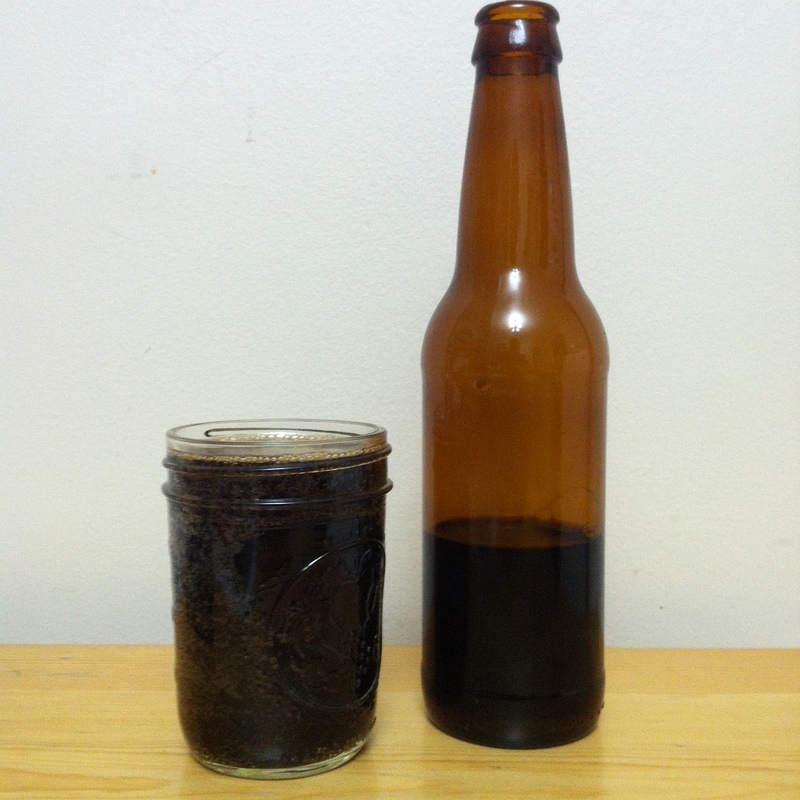 Beer is dark brown / black with almost no head, a fizzing sort of carbonation, this beer never carbed up properly. Low retention, no lacing. Overall…meh. Beer smells a little like chocolate, a little like leather / saddle. Not a strong yeast presence there. Beer is a little thin, the lack of carbonation isn’t do this beer any favors. It is almost smokey in flavor which is odd because there is ZERO smoked malt in this beer. Almost meaty if that makes sense. Definitely a leather quality and some bitterness from the roast. The hops are long gone here. Overall, this is sort of an oddity. I like that leathery flavor in beers but the smoke is odd to me. It tastes like an infected stout unfortunately. I’ll definitely try again at a darker funkier beer but this isn’t it. A miss, thankfully a rarity for me these days. Stay tuned for a lot more saisons. At least I know how to make those. This is a one off and I don’t think I’ll repeat it again. I’d really like to make an Oud Bruin this year…and age it on cherries…would that count as a dark funky beer? I need to look into funky stouts, there is probably a good reason why there aren’t many on the market. Well the next two beer posts coming up are both saisons, shocking. One is the saison made with the hops I picked out at Milkhouse Brewery and Stillpoint Farms last year. I finally got around to writing about it and brewing with them. The second is a Falconer’s flight saison, the first of my “nearly every hop” series of saison for 2015. In the fermenters currently is an Apollo saison and a Wakatu saison fermented with WLP644 instead of the Blaugies yeast. Upcoming are more Galaxy saisons and finally my barrel aged Russian Imperial Stout is bottle conditioning. I have a few food fermentations coming up and a few biology / chemistry of beer posts coming up. So there are those to look forward to. I will also be posting a highly detailed summary of a brew day on my systems and set up. So there is also that to look forward to. Really looking forward to reading more of your work. I work in clinical microbiology and chemistry so I always love finding someone whom enjoys the same aspect of brewing and culturing. I’ll look forward to the next article. Thanks, sorry this article got posted without the text body the first time. I’m always looking for other biologists to nerd out about beer with me. I hope you find something interesting here. Next Next post: Beer Microbiology – What is a pellicle?